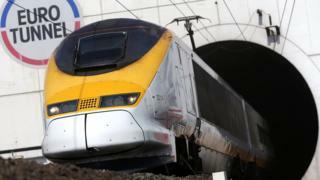 Trains will be permitted to use the Channel Tunnel for three months if the UK leaves the EU without a deal, under a proposed European Commission law. The planned legislation, published on Tuesday, will give the UK and France time to renegotiate the terms under which the railway service operates. The law must be agreed by the European Parliament and EU member states. Britain leaving the EU with no deal is the default position on 29 March unless a withdrawal agreement can be approved. Tuesday’s proposal is aimed at mitigating the “significant impact” that a no-deal Brexit – the UK leaving the EU without any formal Withdrawal Agreement and no transition period – would have on rail transport and connectivity between the EU and the UK, the commission said. The legislation states that, given the “exceptional” urgency of the situation, the proposal will not be subject to the normal eight-week consultation period. The commission also emphasised that the period for renegotiation was “strictly limited” and that the UK must maintain safety standards “identical to EU requirements”. It will now work to ensure that the legislative measure is agreed and adopted by the European Parliament so that it is ready to come into force by 30 March 2019 if necessary. In October, the UK said it was seeking bilateral arrangements with France, Belgium, the Netherlands and Ireland to “facilitate the continued smooth functioning of cross-border rail services”. In recent months the European Council has called for member states to “intensify” preparations for a no-deal outcome. If this happens, there are a number of laws that need to be passed to ensure continuity in crucial areas. Media captionHow does the European Union work? UK Prime Minister Theresa May says she is currently working to get an improved deal from the EU. She wants to secure changes to the legal text of the Withdrawal Agreement she had previously agreed with the 27 other member states, after it was rejected by the UK parliament. The UK government has said that leaving the EU with a deal remains its “top priority”.